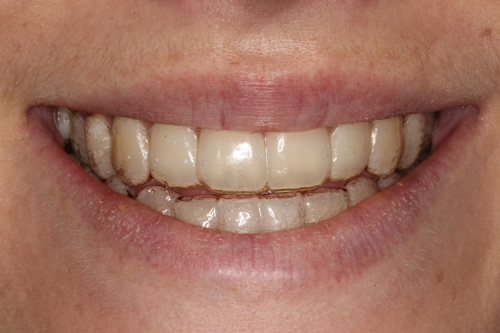 I am well into my Invisalign treatment now and getting on really well with it. I feel like I have got myself into a really good routine with it all, which has really helped with my progress. To achieve the best results, you need to be wearing your retainers all the time, apart from when you are eating and drinking hot liquids. I have found that cleaning my retainers while I’m having my dinner is the best time to do this. I just fill a mug with hot water from the tap, pop in a retainer, a brite tablet and leave my retainers to soak while I eat. Don’t forget to give them a thorough rinse before you put them back in as they won’t taste very nice afterwards. As a reminder, the reason I’m having this treatment done, is to correct my class three bite (in other words my lower jaw sits further forward). Because of this, during my Invisalign treatment, I need to use elastics to slowly bring my lower jaw back. During my next appointment Dr Wong reviewed my progress and attached some buttons to my very back upper molars, this is so the elastics have something to hook onto. Then my lower retainers have little hooks towards the front of my lower teeth, to create that motion of pulling my lower jaw back. 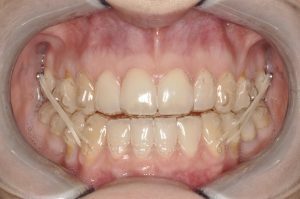 Not everyone will be using elastics during their treatment, but if you are, persevere with them as they are a little bit fiddly to put on. I now have a technique of putting them round my index finger and my thumb and holding them in place of the buttons and hooks and let the elastics roll off my fingers and into place, but you will just have to practice and persevere with them yourself. 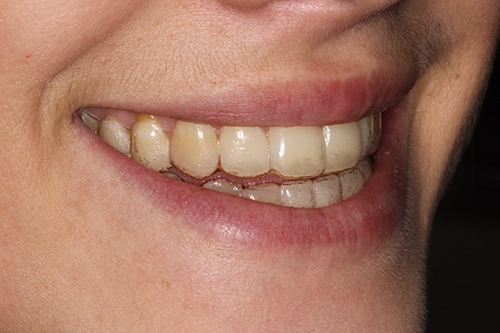 Hello CrownWood patients and friends, it’s month number 1 and I’m going to share my experience of my Invisalign treatment, like I explained in my introduction post. My first appointment consisted of having IPR and the fitting of my first trays. IPR stands for interproximal reductions and is basically just making a bit of space between a select few teeth to make small spaces for them to move. Don’t let this worry you, as it will usually only be about a millimetre, so not noticeable at all and will slowly close over the course of your treatment. Another plus is that it is a rather quick appointment and no need for local anaesthetic. At the end of the appointment, Dr Wong made sure that the Invisalign fitted and that I was able to remove and put them in myself, as well as telling me about ‘chewies’ which I was soon to find out would become my best friends. Chewies are little cylinder-shaped rubber pieces that are used to chew on to help push your retainers down, this needs to be done around 20 times a day or more to achieve the best results. If you find that you do not have your chewies for whatever reason, just bite or clench down hard, to keep your Invisalign in place. The first and biggest thing that came to my attention, was the fact that my speech had been affected a little after having the trays put in. 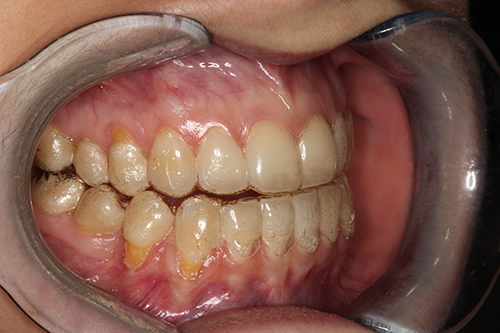 I didn’t let this bother me, and probably has a lot to do with the fact that I work in a dentist and see this sort of thing all the time with people coming in for dentures. That said, it is minor and you just have to persevere and trust that your body will adapt (which it did rather quickly), so again don’t let this dishearten you. To try and speed things along, when I was alone, I would attempt difficult words, for example ones beginning with the letter ‘S’. So I said a lot of ‘silly sausages’ and tongue twisters and felt a bit like a silly sausage while doing it, but it really helped my confidence when talking to people and I feel that this really helped to speed the learning process along. My next challenge was the following day, when I woke up, realising that the inside of my bottom lip was a bit aggravated. I started using Bonjela and things had completely cleared up by day 4. By the end of the first week, I felt as though I had fully adapted to my new Invisalign braces and that I could speak with ease. All in all, I have found the first few weeks of Invisalign to be quite easy and comfortable once the initial adapting week was completed. Hello CrownWood patients and friends, I am one of the nurses here at CrownWood Dental and have recently started Invisalign. 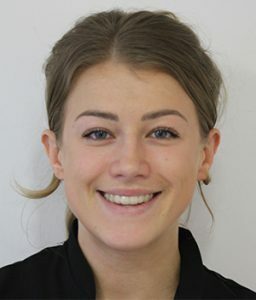 We thought it would be a nice idea for me to document my experiences (a monthly blog) while undergoing Invisalign, for patients who may be interested in the treatment or for patients already undergoing treatment and looking for a bit of reassurance and support. I thought I’d start by explaining the process leading up to the fitting of my first trays. 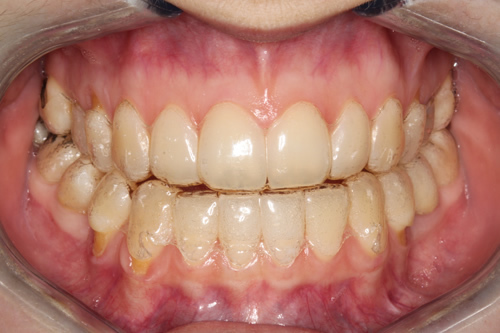 My first appointment was an assessment consultation, where Dr Wong assessed whether Invisalign would be something for me, as I am having treatment to correct my edge to edge bite. During this appointment Dr Wong used a new machine called an iTero machine to simulate a 3D image of my teeth, instead of the old way which would be to take impressions and then send it off to the lab. So, if you are not a massive fan of impressions (which most patients aren’t) this is a huge benefit to the course of Invisalign treatment. Also, during this appointment, detailed pictures were taken from all different angles and my facial profile to uploaded onto my online portfolio. The next stage was my clincheck, which is the 3D image of my teeth but with a simulation of how my teeth will move and showed me what the end result would look like. Dr Wong needed to make sure I was 100% happy before finalising this, as there is no going back after this stage. Then all that was left to do, was wait for my trays to arrive at the practice and have my next appointment.